Today is National Voter Registration Day, which is recognized on the fourth Tuesday of September as part of the broader National Voter Registration Month. 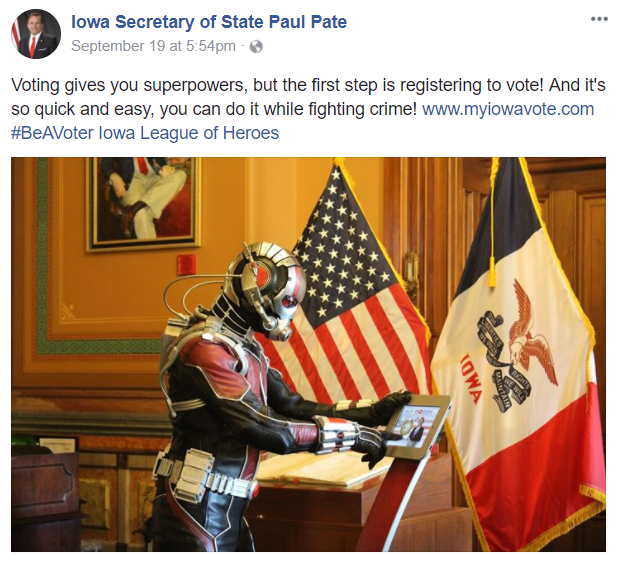 To mark the occasion, Iowa Secretary of State Paul Pate — whose efforts to suppress the vote here have ranged from getting a voter ID law passed and preventing felons from having their voting rights restored to falsely claiming Iowa liberals were trying to allow pedophiles and murderers to vote from behind bars — has been giving softball interviews about “election integrity” to right-wing hacks and, in an apparent effort to appear hip to newly eligible teen voters, posting pop culture memes and photos of big-city superheroes registering to vote at the state Capitol building on social media. This made the Informer curious — is this evidence of the very sort of voter fraud Pate purportedly fights? Let’s have a closer look. 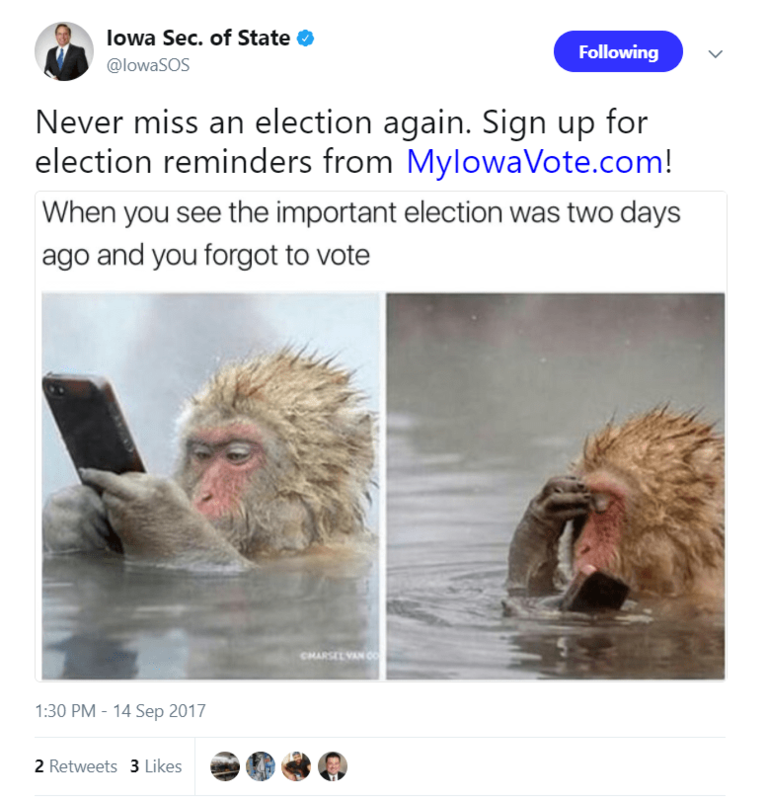 According to the secretary of state’s website, to register to vote online in Iowa, you must be a resident of the state and possess a photo ID in the form of a driver’s license or non-operator’s ID with your legal name. 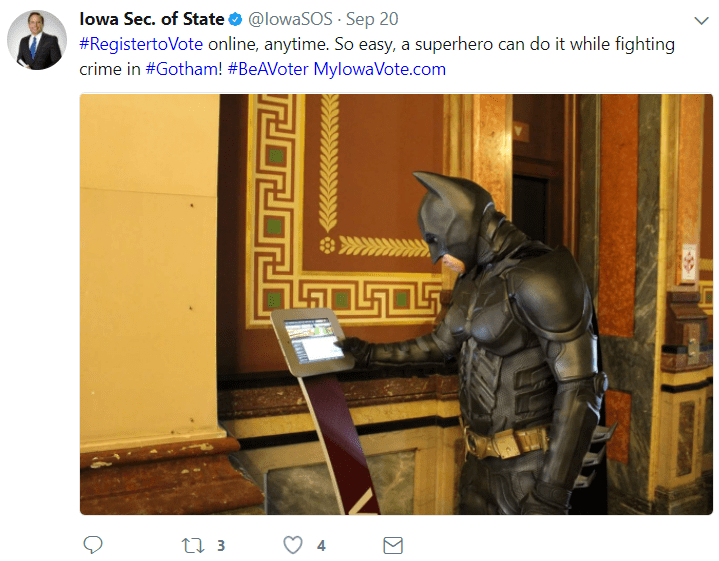 Yet last Wednesday, Pate tweeted a photo of Batman — wearing a mask to conceal his true identity as Bruce Wayne — registering to vote online, saying the process was “[s]o easy, a superhero can do it while fighting crime in #Gotham,” which is a nickname for New York City. 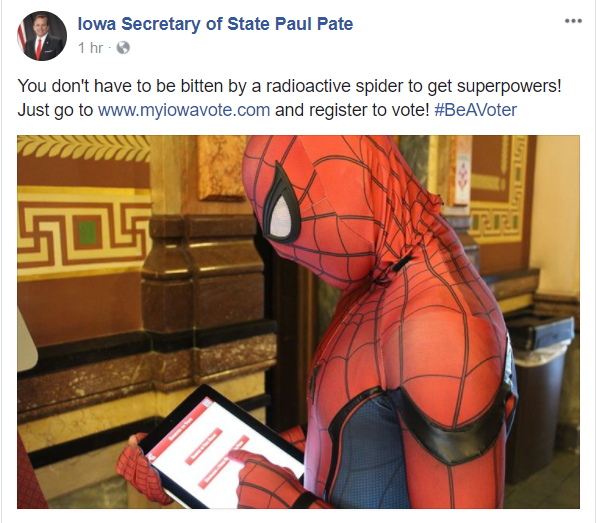 It doesn’t take a radioactive spider bite to obtain superpowers, according to Pate. 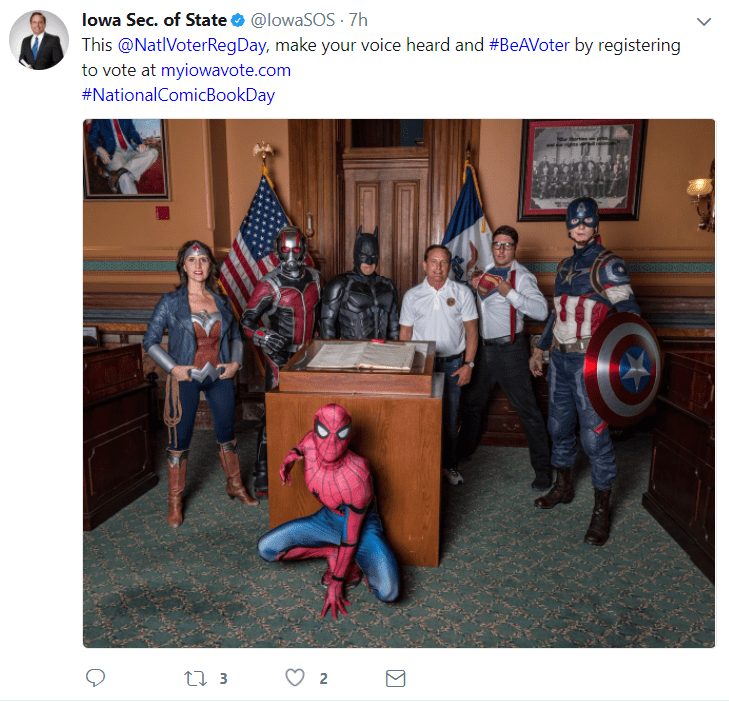 Apparently, all you have to do is register to vote in Iowa and soon you’ll be traversing rooftops with ease — in Queens, New York, where Spider-Man, aka Peter Parker, lives. As with his abovementioned counterparts, there’s strong evidence suggesting Ant-Man, who was recently fighting crime in San Francisco and Atlanta, is not a resident of Iowa. And with his face concealed by a mask, it’s not even entirely clear who’s behind it. Hank Pym, a founding member of the Avengers, has worn the suit, but he reportedly later turned it over to Scott Lang, relinquishing his Ant-Man status. Fighting crime… or committing it?